Review: 2012-05-04, good and fast TKO in the first round: Michael Chandler vs Akihiro Gono gets three stars. The undefeated Michael Chandler ranked as the No.5 lightweight in the world, entered the fight with a record of 9-0-0 while Akihiro Gono had a record of 32-17-7. 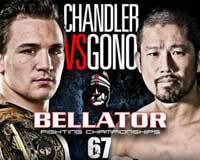 Chandler vs Gono is the main event of Bellator 67. Watch the video!